With the landscape of social media changing almost daily, it is so important to stay up-to-date with the latest changes to ensure your organization isn’t just spinning its wheels when it comes to strategy. It is critical that you are developing content that resonates on a variety of platforms and helps you build a sustainable brand image. 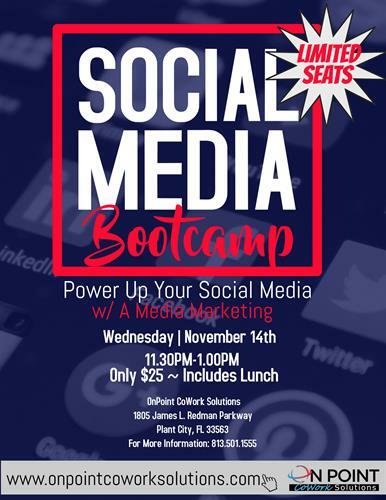 Join OnPoint CoWork Solutions as they present A Media Marking on November 7th to learn more about how social media can help your business acquire new customers through real life case studies and practical application tactics. This event is FREE to OnPoint CoWork Solutions members. Lunch will be provided. $25 Per person with lunch included. Free to OnPoint CoWork Members.